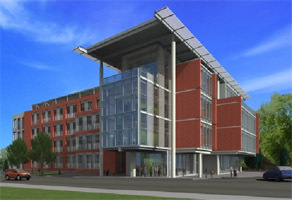 The Biotechnology/Life Sciences Building consists of a new facility of approximately 128,000 gross square feet. The building is a four-story structure with a partially shelled basement. The high-tech facility contains research laboratories, core laboratories, common support space, conference rooms, and office space for faculty and post-doctoral students. The new facility will also house the administrative offices for the newly created Center for Biotechnology in support of the University’s Biotechnology Strategic Initiative, and the administrative offices for the School of Molecular Biosciences. ALLWEST’s involvement on this project included steel pile driving inspections, reinforced concrete inspections and testing, waterproofing inspections, soils compaction testing and asphalt pavement compaction and quality testing.